The far right is claiming that two students who have been featured prominently since the Florida school shooting are actors, tied to the FBI, or both. The conspiracy has been promoted by the office of a Florida state lawmaker and President Donald Trump's eldest son, Donald Trump Jr. There is a widening conspiracy theory gaining traction on the far right that student survivors of a Florida school shooting who have made a series of TV appearances since last week's massacre are actors, part of an FBI plot, or both. The conspiracies have centered on David Hogg, who has been featured on CNN and CBS following the shooting at Marjory Stoneman Douglas High School that left 17 people dead and more than a dozen others injured, and Emma Gonzalez, who has spoken out about the need for politicians to enact gun-control legislation. Hogg, a student journalist who says he interviewed classmates during the shooting, has since become one of the most prominent student voices, calling for stricter gun-control measures and characterizing the response of politicians — and specifically President Trump — as "disgusting." In his case, some far-right outlets have pointed to his father's being a retired FBI agent to suggest something nefarious in the student's frequent media appearances. "Why would the child of an FBI agent be used as a pawn for anti-Trump rhetoric and anti-gun legislation?" Lucian Wintrich wrote on The Gateway Pundit. "Because the FBI is only looking to curb YOUR Constitutional rights and INCREASE their power. We've seen similar moves by them many times over. This is just another disgusting example of it." On True Pundit, a story linking Hogg and the FBI ran under the headline "Outspoken Trump-Hating School Shooting Survivor is Son of FBI Agent; MSM Helps Prop Up Incompetent Bureau." "The kid who has been running his mouth about how Donald Trump and the GOP are teaming to help murder high school kids by upholding the Second Amendment is the son of an FBI agent," an unnamed author wrote. "David Hogg is a school shooting survivor in Florida. At least that is what the mainstream media has told us. We wouldn't be surprised by anything involving the FBI at this point." Pro-Trump accounts have shared the stories on Twitter and in some cases have thousands of retweets. The conservative One America News Network promoted a tweet suggesting Hogg may be "running cover for his dad who works as an FBI agent at the Miami field office." The stories gained even more attention when Trump's eldest son, Donald Trump Jr., liked that tweet and another post sharing the True Pundit story. Later on Tuesday, True Pundit posted another story under the headline "BUSTED: Trump-Hating School Shooting Survivor Visited CNN HQ Before the Shooting; Ranted Live on CNN After." The far-right publication published photos, claiming to be of Hogg, both at a CNN newsdesk and wearing a CNN T-shirt before last week's shooting. "But now we learn Hogg was hanging out at CNN headquarters in Atlanta, GA sometime Before the school shooting," the unnamed author wrote. "Before the shooting. Posing behind an news anchor desk? Perhaps Hogg's career dream is to sign on with the network — a young Jake Tapper — as he has portrayed himself since the deadly shooting that claimed 17 students as a 'student journalist and entrepreneur.'" Others went after Gonzalez for being "coached" on how to respond to the incident. The conspiracies seemed to spill into the ranks of government too. 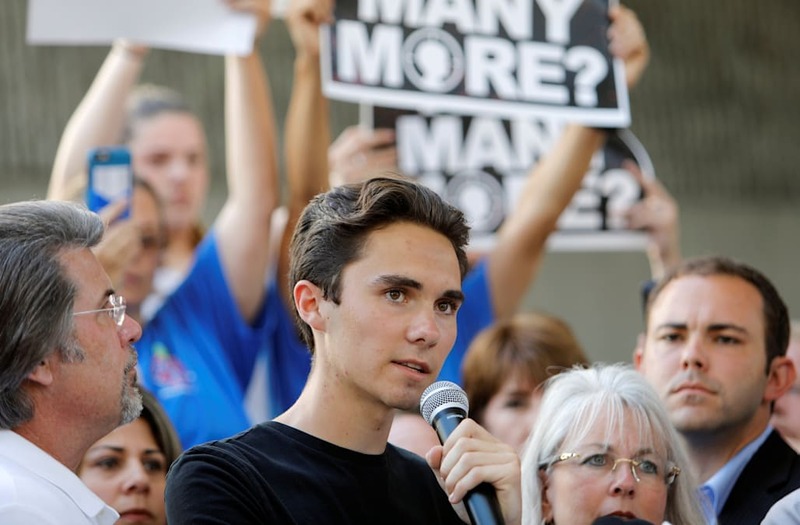 Benjamin Kelly, an aide to Republican Florida state Rep. Shawn Harrison told the Tampa Bay Times Tuesday afternoon that both Hogg and Gonzalez "are not students here but actors that travel to various crisis when they happen." "Claiming some of the students on tv after #Parkland are actors is the work of a disgusting group of idiots with no sense of decency," he tweeted. Hogg responded to Rubio's tweet, thanking him for his comment. The Florida House Speaker Richard Corcoran announced Kelly's firing late Tuesday: "On behalf of the entire Florida House, I sincerely apologize to the students targeted and again commend them for their courage through this unspeakable tragedy," Corcoran said. By Tuesday evening, Kelly's Twitter account had been deleted. The focus on Hogg and Gonzalez comes in the wake of another popular right-wing theory related to the shooting — that the FBI missed warning signs about the Florida gunman because of its investigation into Russia's interference in the 2016 US election and whether Trump's campaign colluded with Moscow. "Very sad that the FBI missed all of the many signals sent out by the Florida school shooter," he wrote Saturday just before midnight. "This is not acceptable. They are spending too much time trying to prove Russian collusion with the Trump campaign — there is no collusion. Get back to the basics and make us all proud!"